Michael & I had just got out of show, and we were on the hunt for dinner. It might be hard to believe but good late night food is a little hard to find in Vegas. Sure, there are casinos, bars, and clubs open 24/7 but something besides a hamburger is hard to scrounge up. 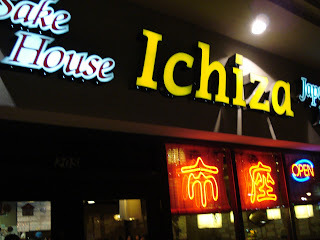 As we were driving around, bulgogi came up in the conversation, and T knew just the place Unfortunately, we got there at it closed, so we were walking back towards the car when we saw a restaurant called Ichiza in the same strip mall. You don’t expect to see a sushi restaurant off the strip to be packed at 11, but we walked right in to a full house. The waitress told us there would be a wait, but they did have a big table available but only until midnight. A reservation at midnight? I had a hard time believing that but I told her we would be long gone by midnight. So she showed us to the table. We each ordered a bowl of soup in a hurry, not wanting to be there too long. It wasn’t until after we ordered that we noticed the restaurant was littered with pieces of paper that had dishes and specials not on the menu. The daily special board had over 35 items. Less than 10 minutes later, our soups were ready. 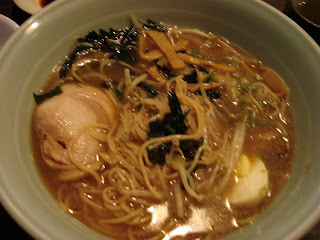 I got a ramen soup with a piece of char sui and a half egg. I've never seen char sui like this. It looked like a slice of pork tenderloin, whereas I'm used to the Chinese style char sui with that beautiful red glaze. 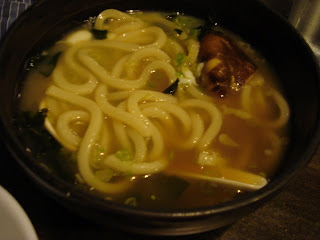 T had ordered a soba noodle soup, and the nice thing was we were given 2 extra small bowls a piece, so plenty of ways to share. Wouldn’t you know it that we both thought our respective soup was the best. 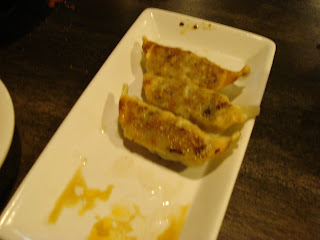 However, we could agree that the gyoza was top notch. The pictures are really deceptive, those bowls of soup were gigantic, and pretty much kicked our asses. We were in and out of there in less than half an hour. I only wish we had the time and appetite to try more of what Ichiza has to offer.